The Never Mine. Abandoned to the elements back in '85, some folks claim the old place is haunted. High above Big Thunder Creek, on the rugged slopes of Baxter's Butte, rests the Never Mine. This is old Badwater Baxter's original claim, the oldest developed mine in these wild canyons and the same rich find that started the gold boom in Thunder Mesa Country. According to legend, when Baxter first set out from Fort Wilderness in 1865, the naysayers and local know-it-alls at the fort canteen told him he'd never find anything prospecting in that weird hoodoo country. Old Baxter just grinned beneath his big mustache, slapped his burro on the rump and said, "Never say never!" And the rest, as they say, is history. Though it was undoubtably a rich find, misfortune and strange goings-on seemed to plague the Never Mine right from the start. Mysterious cave-ins, inexplicable equipment failures, frequent accidents and more than a couple of grizzly fatalities soon gave rise to rumors that the claim was cursed or haunted. Evidence of an old Indian burial ground had been found nearby and it was commonly known that the local Ute people held the entire Mesa as sacred. It's no small wonder then that Baxter became a little addled by all the misfortune and eventually sold the claim in 1877. He drifted west to Discovery Bay where the remainder of his years and his fortune were spent experimenting with outlandish airships. 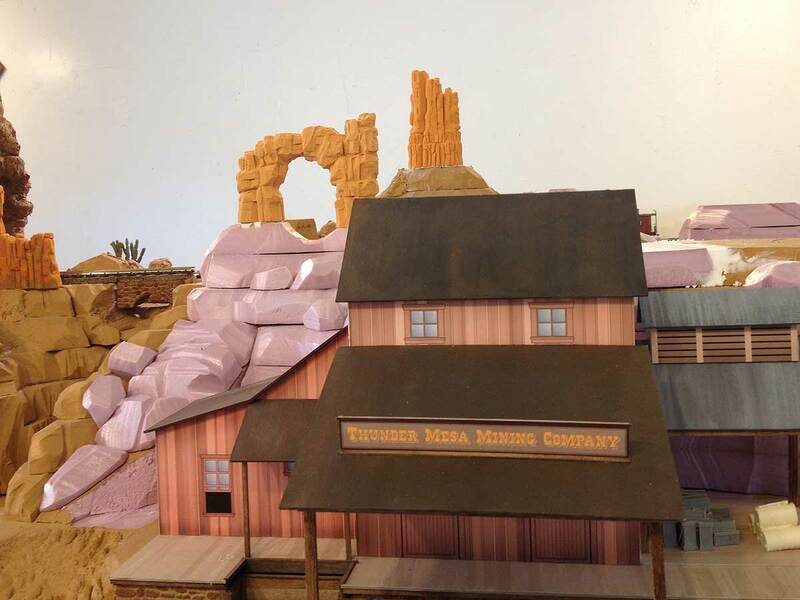 The Never Mine was taken over by the Rainbow Ridge Mining Co. which was later acquired by the TMMC. By all reports, the strange happenings continued until the rich ore finally played out and the mine was abandoned in '85. Today, the dry desert wind whistles through the timbers of the old head-frame and the mine opening has been boarded up to keep out the curious. Or perhaps, to keep something in. Rumors of hauntings persist. 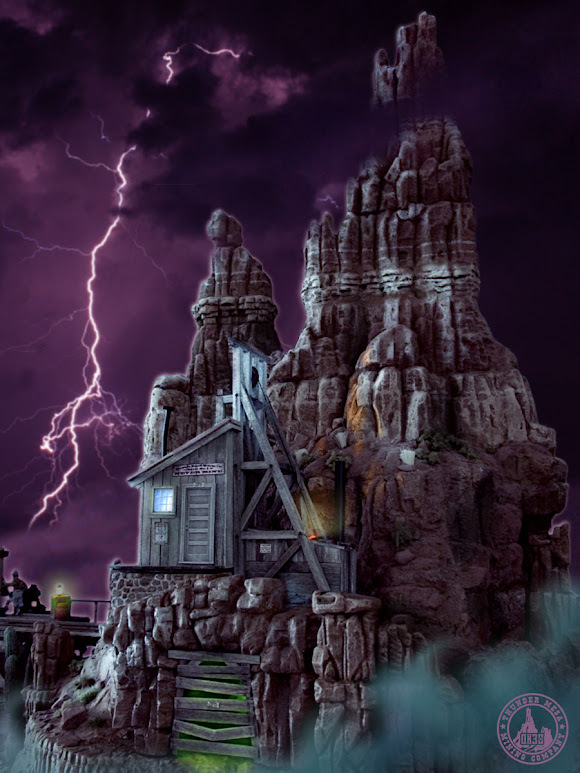 Some foolish mortals say that on certain nights, when clouds obscure the stars and the zephyrs howl down the canyons, strange apparitions and ghostly voices seem to emanate from the long abandoned shaft house and the dark, gaping drift of the Never Mine. The shaft house and head frame of the Never Mine; a little less spooky when photographed outdoors in the brilliant Arizona sunshine. 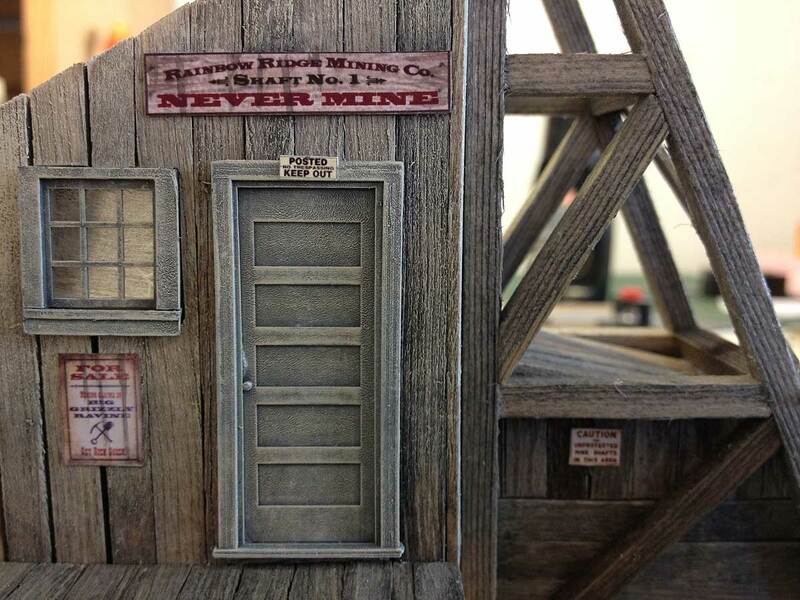 The crooked smoke jack is a nod to the original Rainbow Ridge Mine that helped inspire this structure. 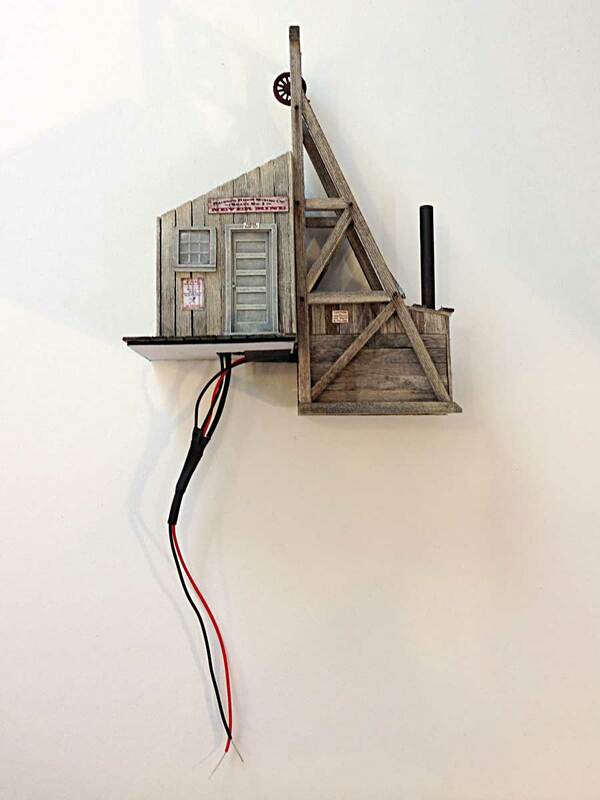 Inspiration for the Never Mine came from several sources. 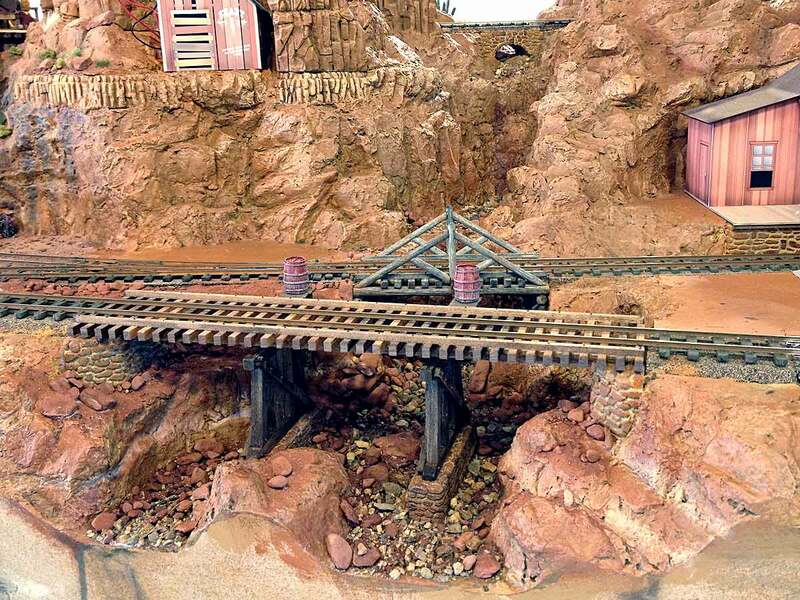 The design is loosely based on the Rainbow Ridge Mine, a tiny structure that once stood above the first tunnel on Disneyland's original Mine Train Thru Nature's Wonderland. 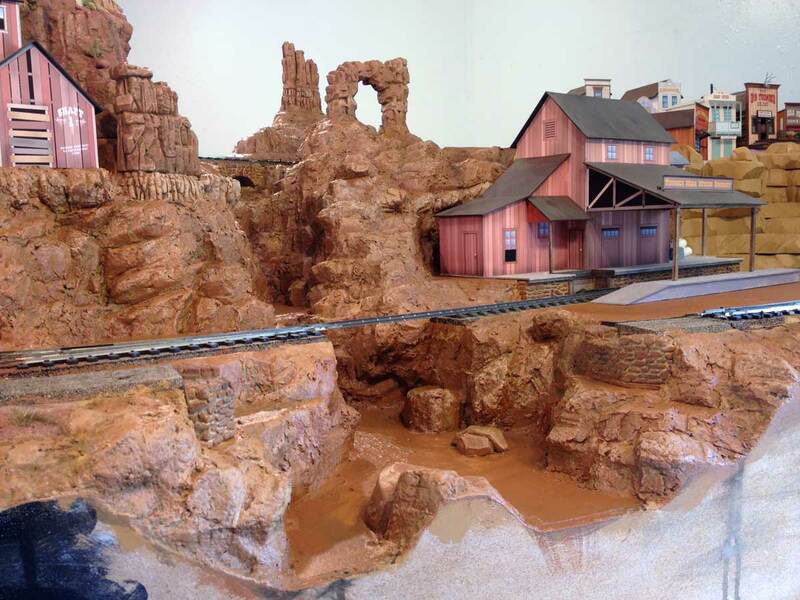 The overall look and weathering was inspired by scouting trips to southwestern Colorado's Red Mountain Mining District. 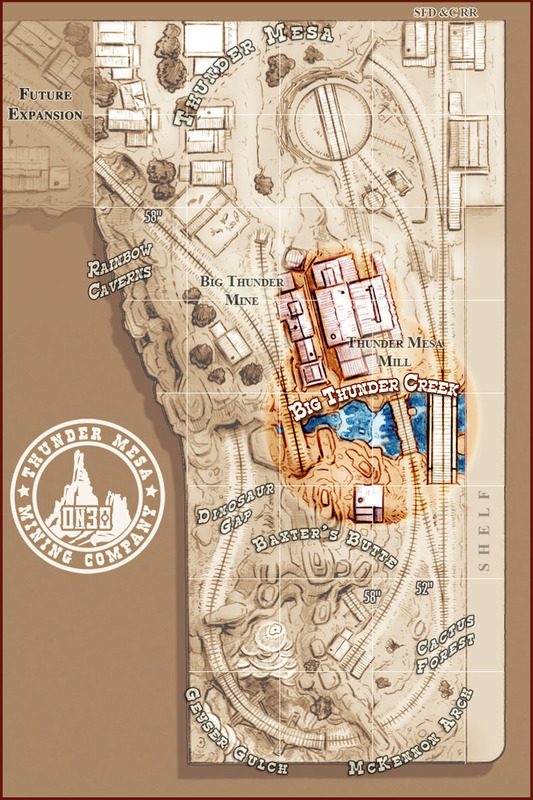 The name, "Never Mine," is a direct reference to a bit of Imagineering humor: A signpost in the queue area for Disneyland's Big Thunder Mountain Railroad points the way to several local landmarks, including Dinosaur Gap, Coyote Canyon, Busted Flats and Never Mine. 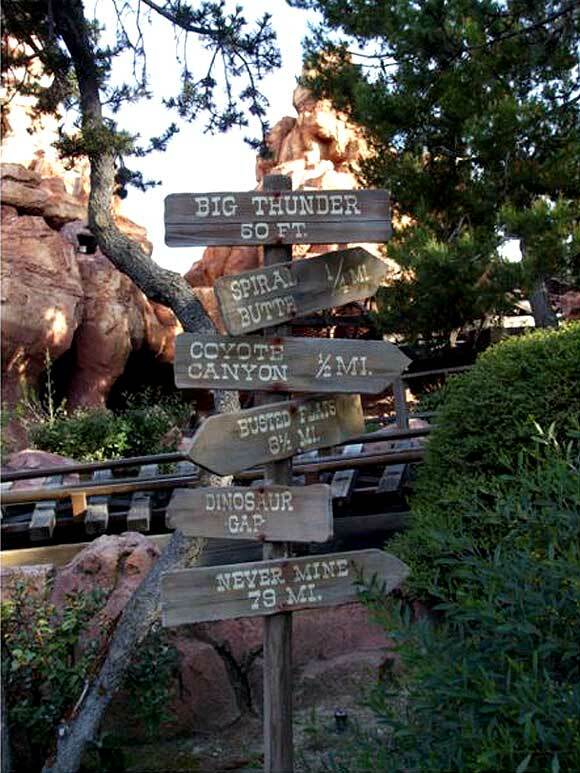 A signpost at Disneyland. 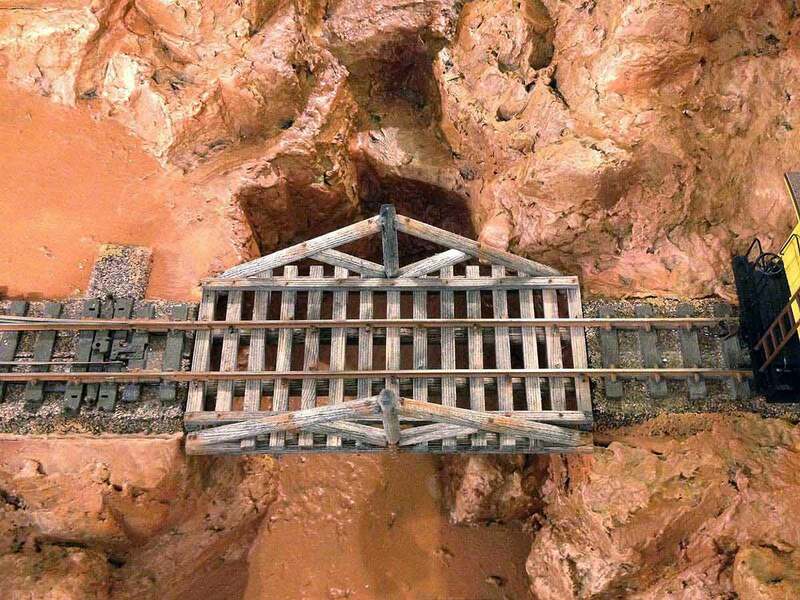 79 miles to the Never Mine? I think it's closer than that. I began the structure with no real plan, just modeling by the seat of my pants. Generally, I wanted a small and interesting looking abandoned mine to help round out the scenery near Big Thunder Creek. 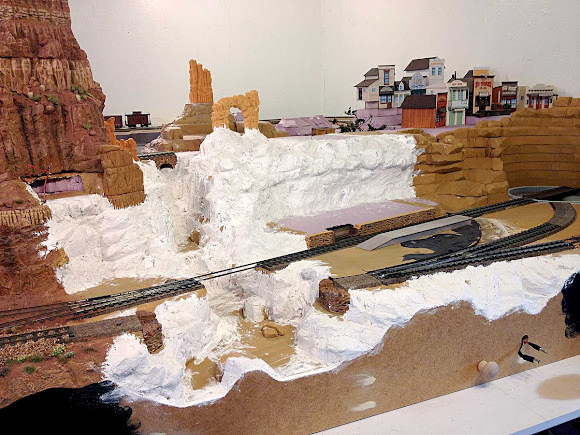 I had long thought that something which looked a little spooky and haunted might be just right for this spot and a paper model mock-up of a generic abandoned mine held the space for a couple of years. 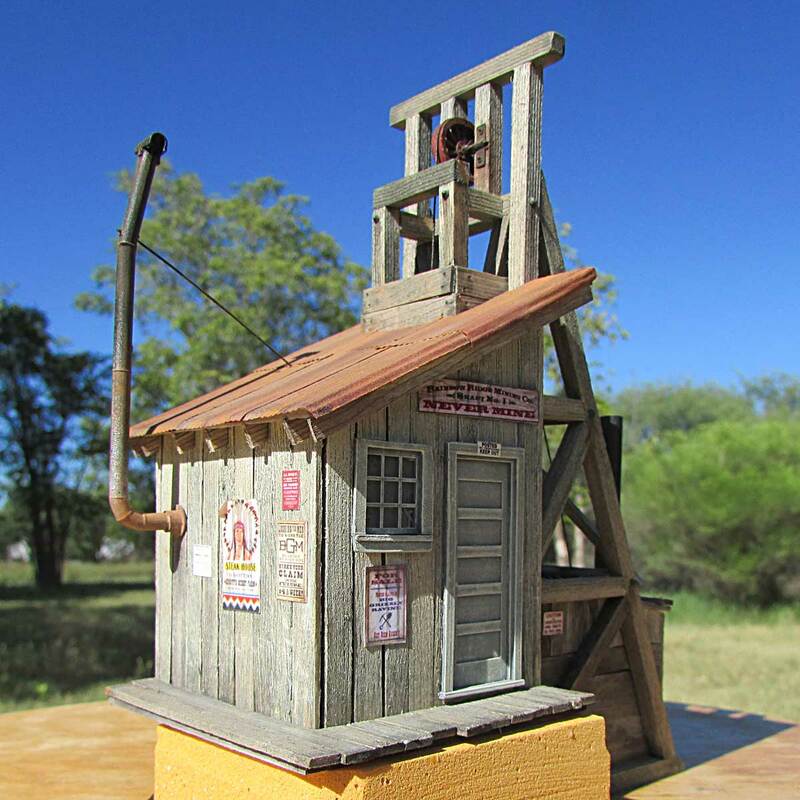 Follow along with the photos and captions to see how the shaft house and head-frame for the Never Mine went together. The available space for a mine was pretty tight, only about 5" wide by 3.5" deep. Fortunately there was a lot of vertical space to play with and my solution was to simply stack all of the mine elements one on top of the other. 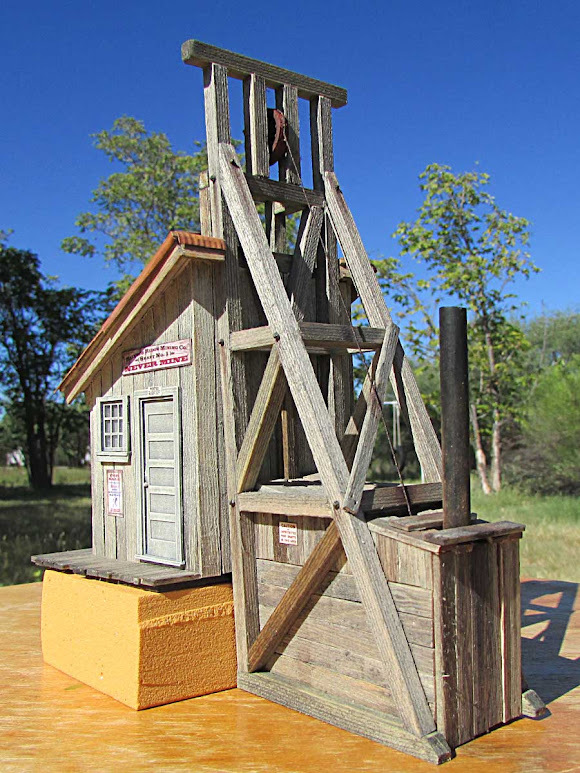 A shaft house and head-frame sits on a stone foundation directly above a mine adit, which in turn will sit above a trackside ore tipple. 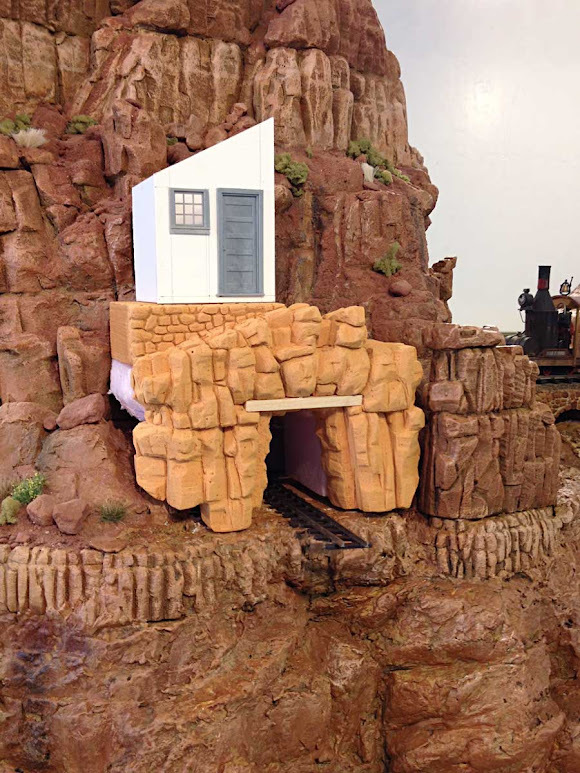 The cliff face with the adit, or drift, was carved from Balsa Foam to match the surrounding scenery and the hoist house was laid out with 1/16" thick illustration board. The door and window are styrene Grandt Line catsings. 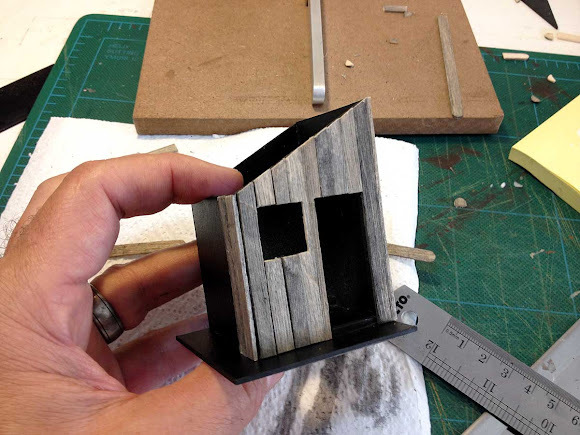 The tiny shaft house is a scale 8'x8' with a 24" wide catwalk on two sides. 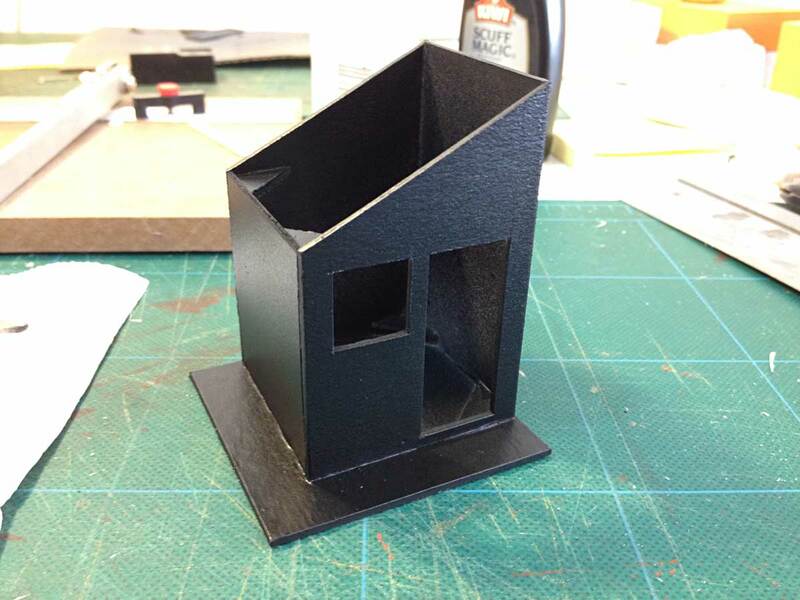 The illustration board structure was spray painted flat black. Coffee stir sticks were distressed with an X-acto knife and razor saw, adding woodgrain, splits and knotholes before being stained with a mix of Kiwi black shoe dye thinned with alcohol. The stir sticks are cheap, readily available, and scale out to about 11" wide in 1:48. They were cut to size and then glued in place over the illustration board with yellow carpenter's glue. 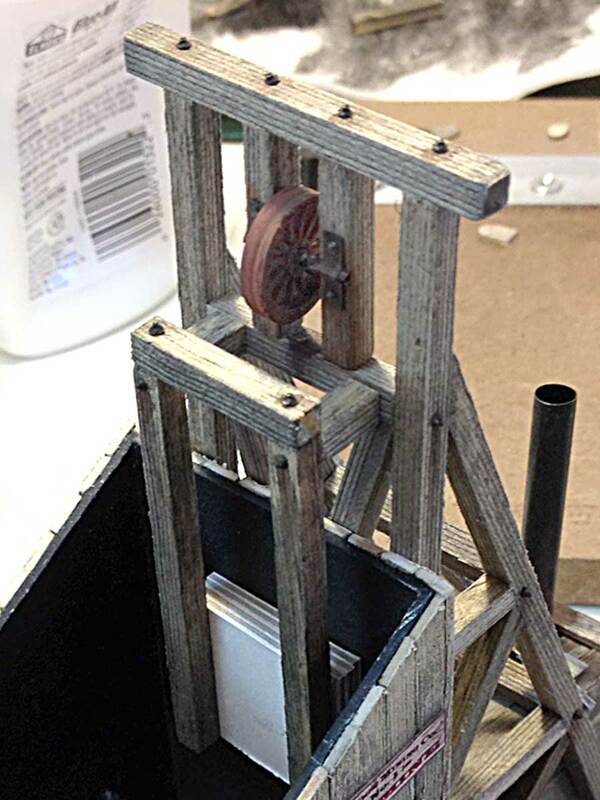 A foamcore jig was created to keep the head-frame supports straight and true during assembly. The head-frame was built up with scale 8"x8" timbers following photos of similar structures I'd seen in Colorado. 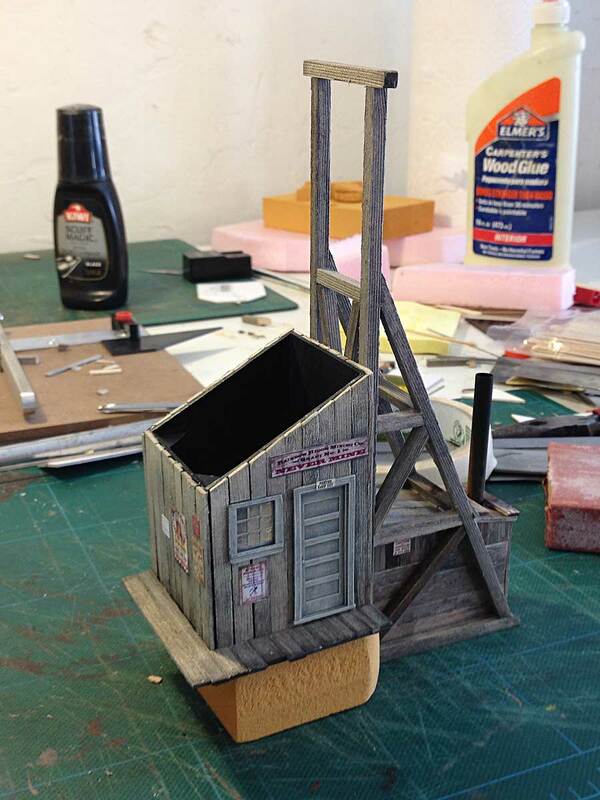 The head-frame was glued in place to the side of the shaft house. 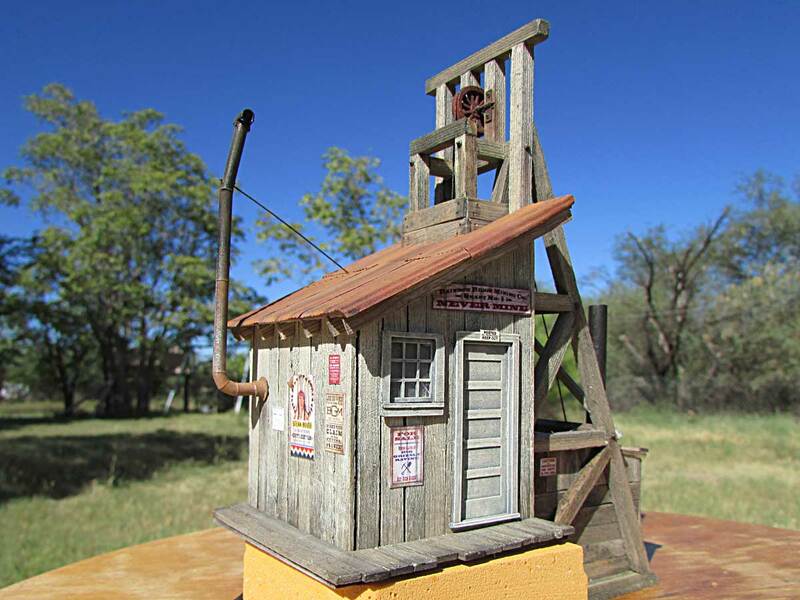 For added visual interest, the head-frame sits an inch (4 scale feet) lower than the shaft house. The problem of where to put the hoist mechanism on such a tiny mine was solved by building this simple shed between the legs of the head-frame. I guess there's a little steam hoist in there that must draw its water directly from the nearby creek. The sooty smokestack is a painted soda straw. After assembly, the shaft house was dry-brushed with acrylic Buff Titanium to simulate old, faded whitewash. The Grandt door and window castings were primed and then dry-brushed to match, and signs were printed out on heavy paper to decorate the structure. Grandt nut/bolt/washer castings were installed in logical places on the head-frame and watercolors were used to further age and weather the boards. Here rust stains are being added with a #1 sable brush. I mix up a batch of burnt sienna and ultramarine watercolors to create varying shades of warm grey. 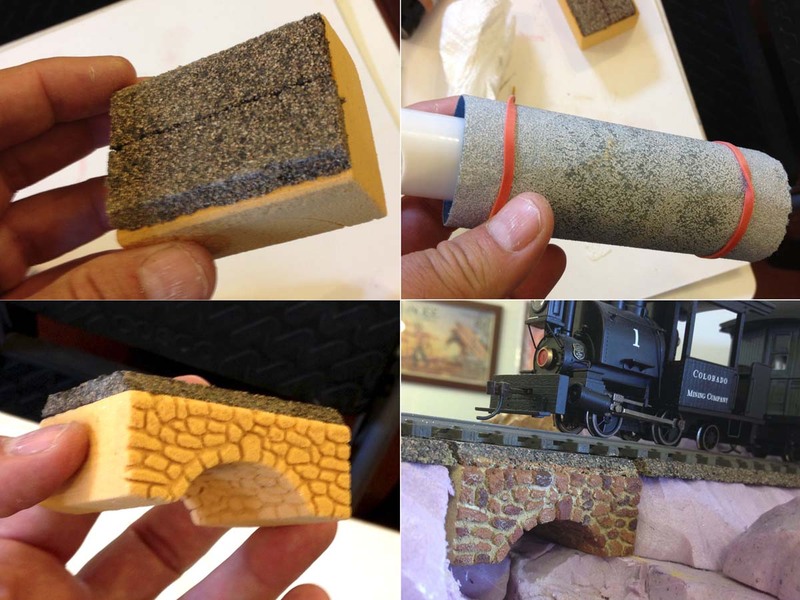 These are then brushed on to simulate age, rust, soot, water stains and other weathering effects. 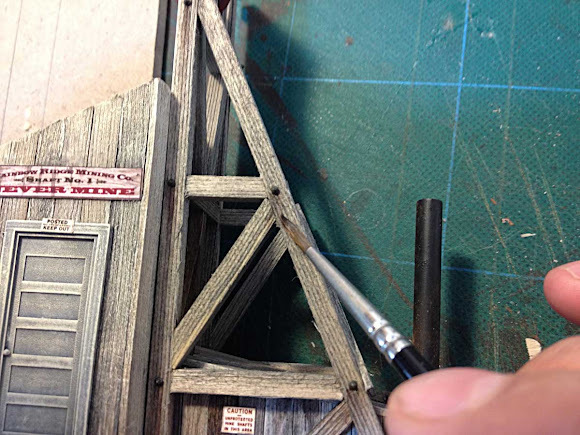 The watercolors soak right into the wood for a very realistic look and if the color gets too heavy it is easy to scrub off and blend with just a bit more water. 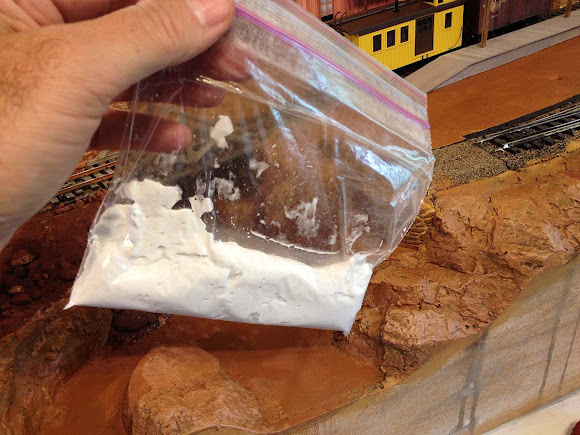 If you try this technique though, take care, too much water can dissolve the yellow or white glue on your carefully constructed model. 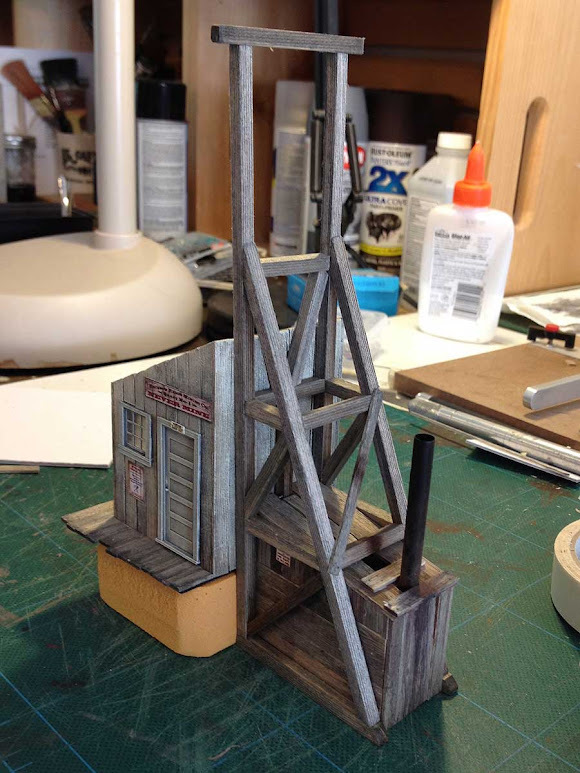 Here is the rest of the head-frame assembly and the parts hidden by the shaft house roof. The sheave wheel is from a 1:43 Model T truck, turned down with a rotary tool. The brackets holding it in place are painted paper with nut/bolt.washer castings affixed. Before the roof was installed, lighting effects were added in the form of two 5mm LEDs. A blue LED emits a ghostly glow through the frosted panes of the shaft house window, while a flickering amber LED simulates a mysteriously rekindled firebox glimpsed through the roof of the hoist shack. The LEDs are wired in series with 510 ohm resistors soldered to the positive diodes of each bulb. A pigtail of wires protrudes from the base of the structure to connect to the layout's 9v DC accessory buss. 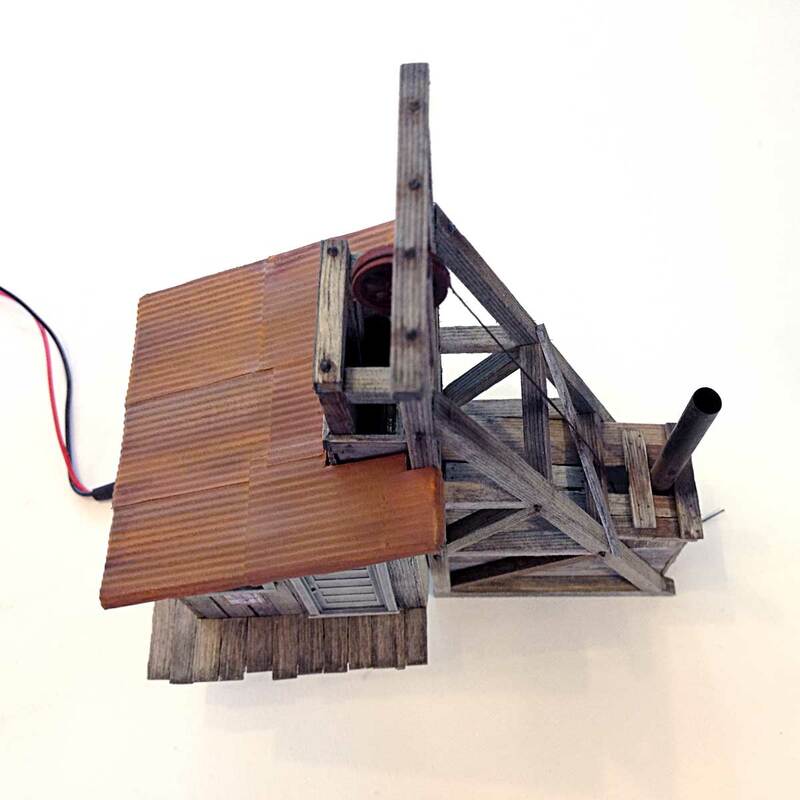 The shaft house roof was made from illustration board with paper corrugated roofing. The roofing was cut into scale 4'x8' panels and painted with red oxide primer before assembly. Weathering was done with watercolors and brown, black and rust colored chalk powders. Rafters and rafter ends were created from scale 1"x8" stock. 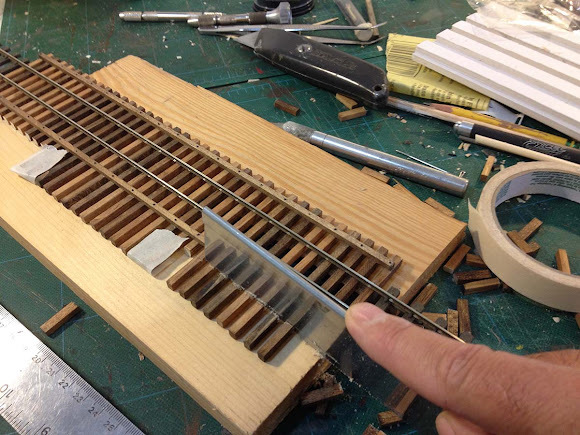 The crooked smoke jack is a Grandt Line casting with the crook created by sawing off the uppermost section, filing at an angle, and then glueing back in place. The jack was airbrushed silver and black and then weathered with powdered chalks. Another view. The hoist cable is black painted elastic thread. With the shaft house and head-frame complete I can now turn my attention to the mine adit and ore dump down below. There will be a lot more on how I built those coming in a future post. For now, thanks for checking in. Comments and questions are always welcome. Adios amigos! 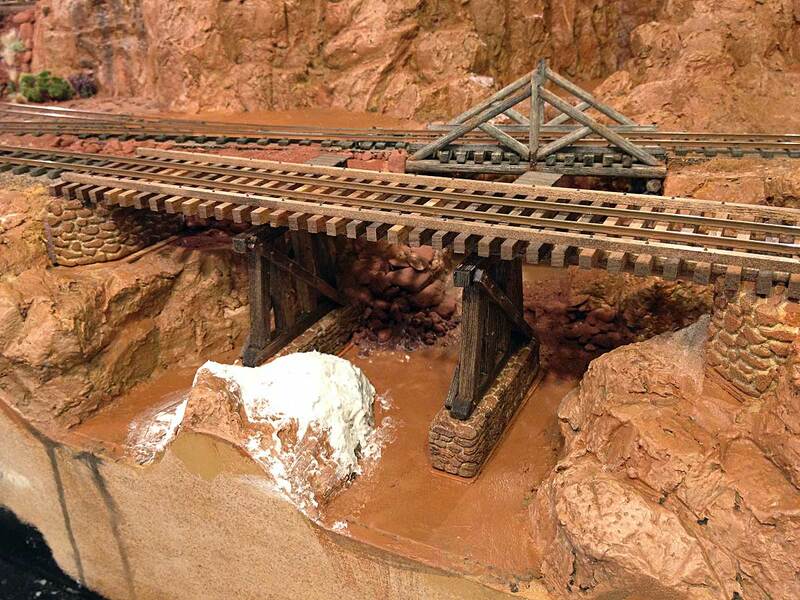 This past week saw a lot of progress on the layout with the completion of three railroad bridges across Big Thunder Creek. Up on the Calico High Line, a small stone arch crosses the creek where it's narrow at the source, while farther down, a rustic 20' king post truss does the job on the mill spur. 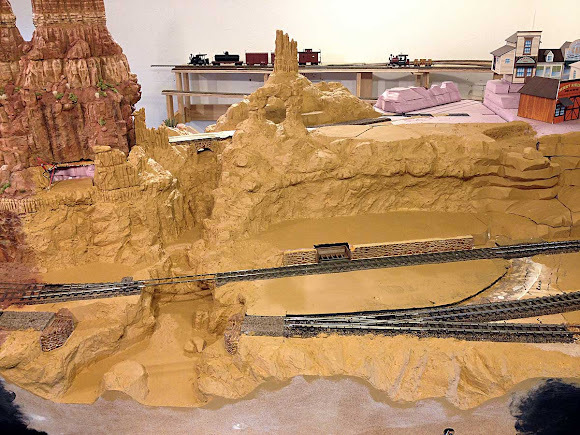 Near the front of the layout, a 48' wooden trestle on the main line spans the wide, clear pools below. Follow along with the photos to see how each of these bridges was constructed and installed. The stone arch bridge is little more than a fancy culvert, carved from a block of 1" thick Balsa Foam. The arch was shaped with some medium sandpaper wrapped around a small plastic bottle and the stones were scribed in with the point of a hard 5B pencil. HO cork roadbed was glued to the top to bring it flush with the track. 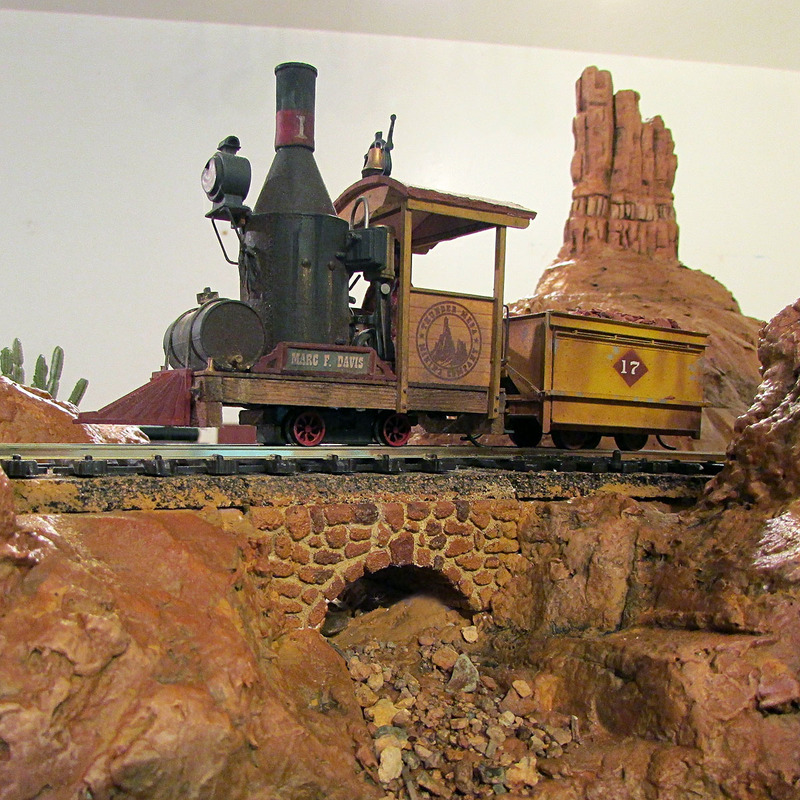 Here's the stone arch painted and blended into the surrounding rock-work. 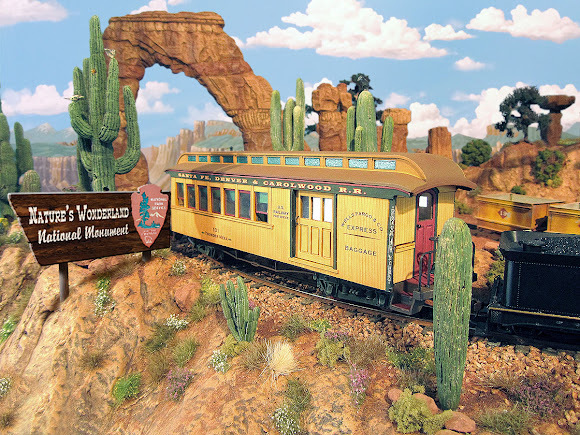 The Balsa Foam carvings are painted in shades to match the surrounding scenery using artist's acrylics. An undercoat of Buff Titanium (a very light tan) is brushed on to seal the carving and represent mortar. A stiffer brush is then used to dry-brush Raw Sienna, Burnt Sienna and Burnt Umber on to the faces of the stones. Finally, a very thin wash of Carbon Black was brushed over all to darken and blend everything together. The deck, trusses and abutments for this bridge were assembled separately at the workbench before everything was put together directly beneath the existing rails on the layout. 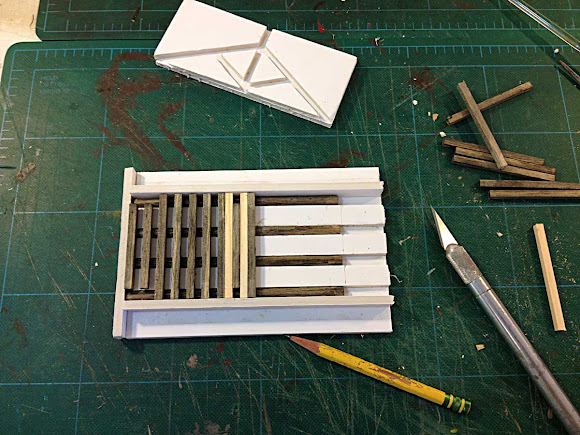 This photo shows the simple foamcore jigs that were used to assemble the deck and trusses. Kappler 10' suger pine bridge ties were used above 12 scale inch (1/4") diameter dowels to build the deck. All wood was scribed with a razor saw to simulate age and grain before being stained with a mixture of Kiwi black shoe dye thinned with 70% isopropyl alcohol. My method for creating this stain is to simply empty nearly all of the dye out of the Kiwi bottle and then refill it with alcohol, replace the foam applicator top, shake well and it's good to go. One of the truss assemblies under construction. 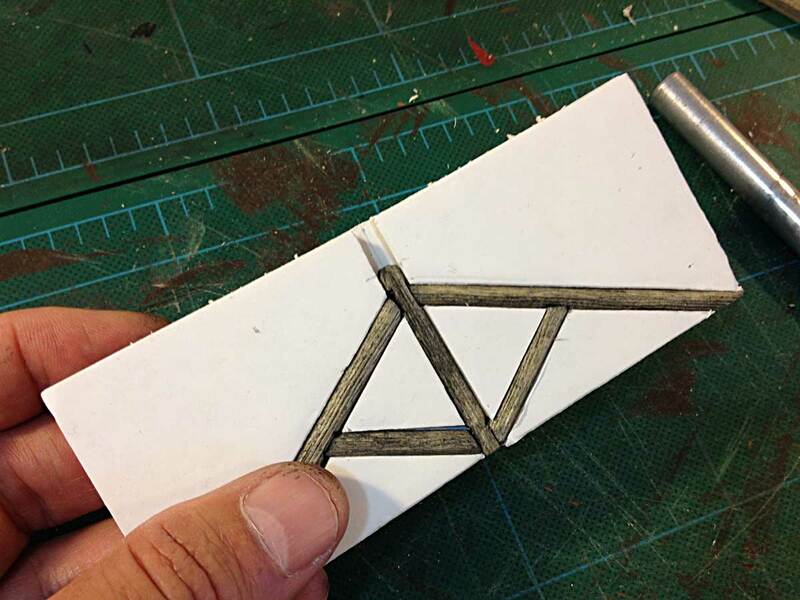 A king post truss is about the simplest truss one can make. It was a popular design in the 19th century for crossing spans of about 20' or less (any longer would require something stronger like a queen post truss). The beams of this truss are a scale 8" in diameter and notched at the joints. The completed deck installed beneath the rails. 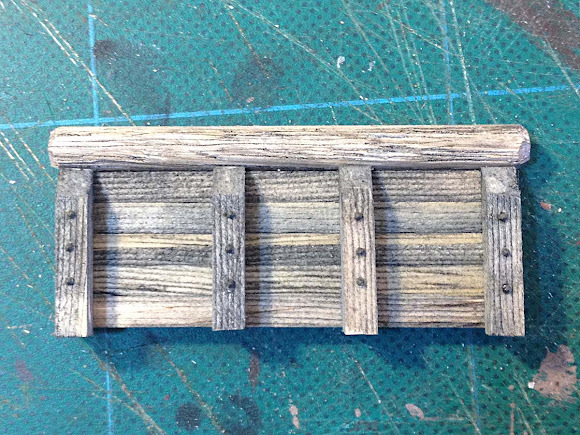 A few dabs of thick ACC were applied to the bottoms of the rails and the deck was slid into place. Blocks of foam were used to support the deck from below while spikes were driven into pre-drilled holes. A tiny dab of ACC on each spike guarantees they won't work back out. Next it was a simple matter to cement the trusses into place and add a little colored chalk weathering. 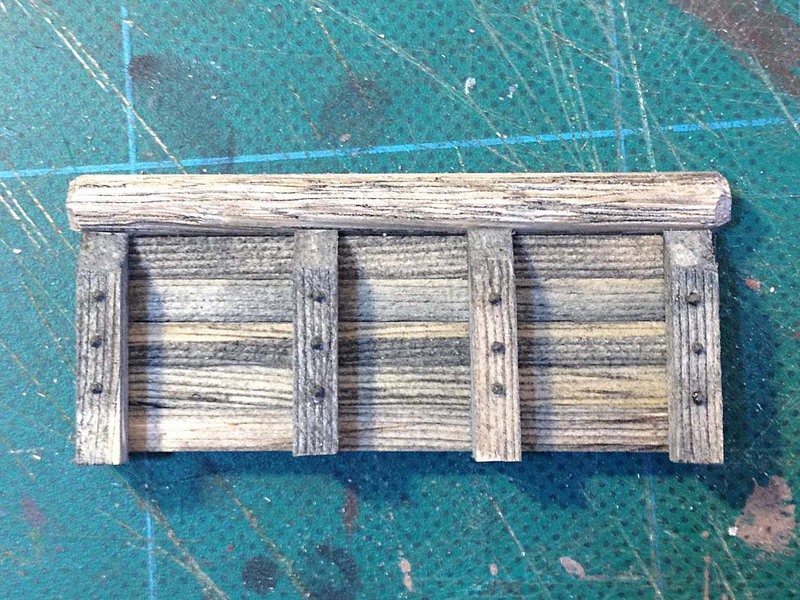 The iron plate supporting the king post came from a set of Grandt Line narrow gauge boxcar details. A few strategically placed nut/bolt/washer castings complete the bridge. Overhead view of the 20' king post truss. 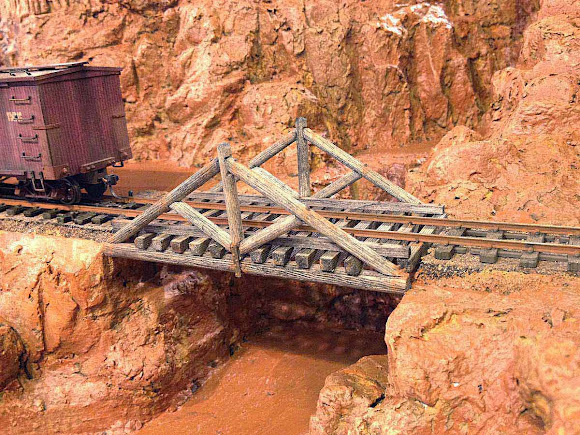 This bridge is about as narrow as a narrow gauge bridge can be. The caboose just visible at right was used to check clearances and my widest rolling stock just squeaks through with only a scale inch or two to spare. A pair of wooden retaining wall bridge abutments were also built at the workbench, again using Kappler ties, NBWs and 1/4" diameter dowels. Installing the abutments beneath the bridge was a little harder than I thought it might be. But after a little cutting, fitting, re-sculpting and cussing, both abutments were cemented into place and the scenery blended in around them. 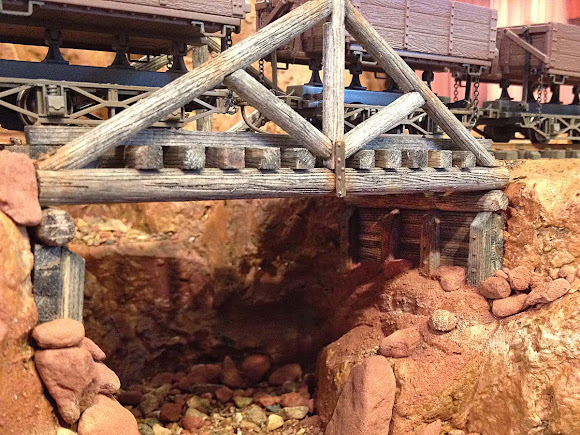 The Big Thunder Creek trestle started life as a Hermosa Creek Truss kit from Goldline Products and for quite a long time I had intended to build it as designed. In fact, there are many photos of the bridge in various stages of completion in older posts on this site. However, once the real planning for scenes around Big Thunder Creek began it became apparent that the bridge as built would be a little too overpowering. 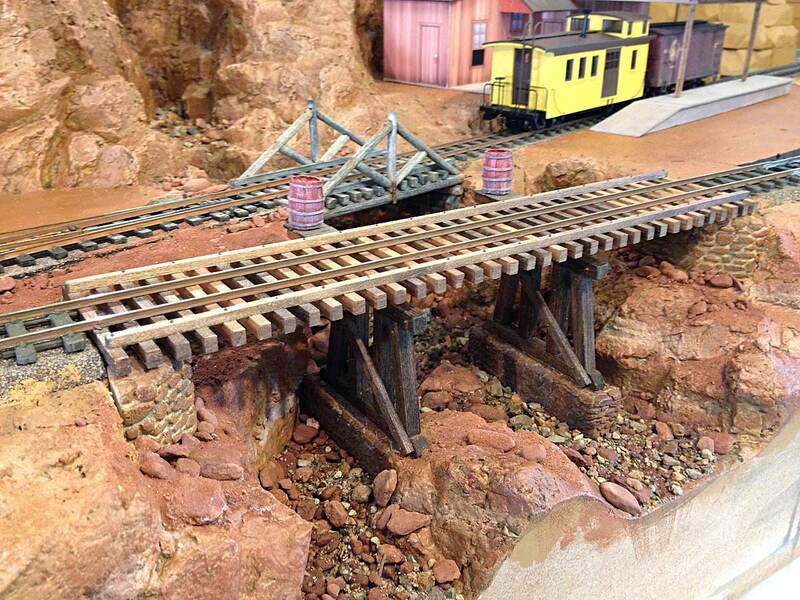 My solution was to remove the trusses and modify the bridge deck into a low slung trestle. 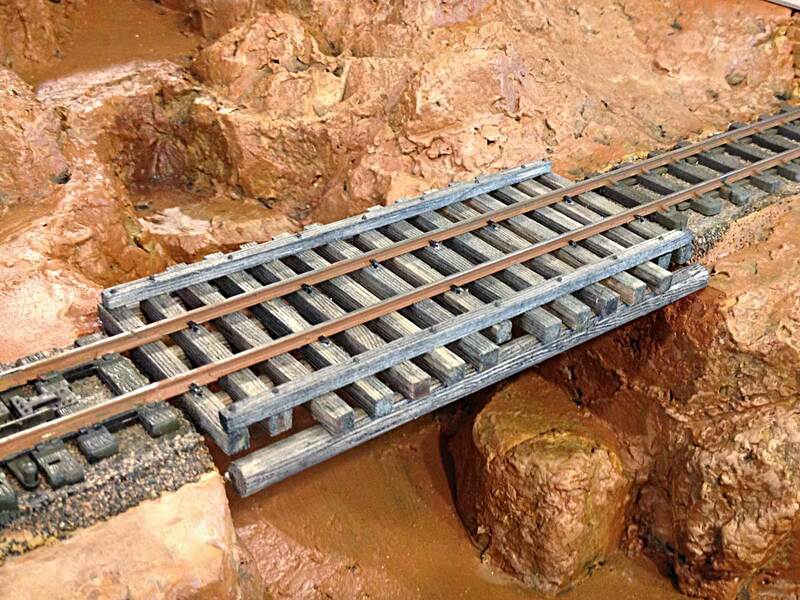 The first step was was to remove the bridge from the layout and then cut down the ties with a razor saw, shortening them from 16' to a more trestle appropriate 10'. The masking tape marked ties not to be cut so they could be used to support fire-barrel vestibules. 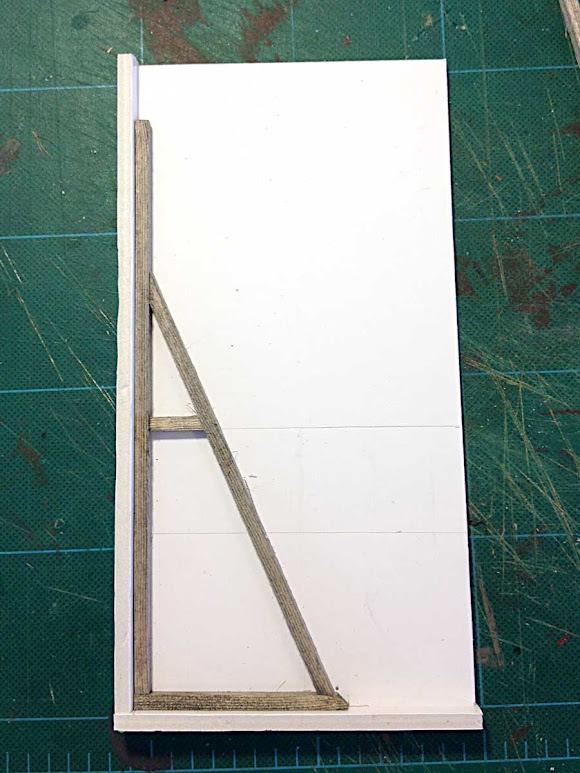 Once again a simple foamcore jig was made to aid construction of the 10' high trestle bents. Scale 12"x12" lumber was used for the posts and beams, and 6"x8" stock for the sway braces. The wood was distressed with a razor saw and stained with Minwax Dark Walnut pens prior to assembly. Since this trestle sits in water, stone footings were carved from Balsa Foam. 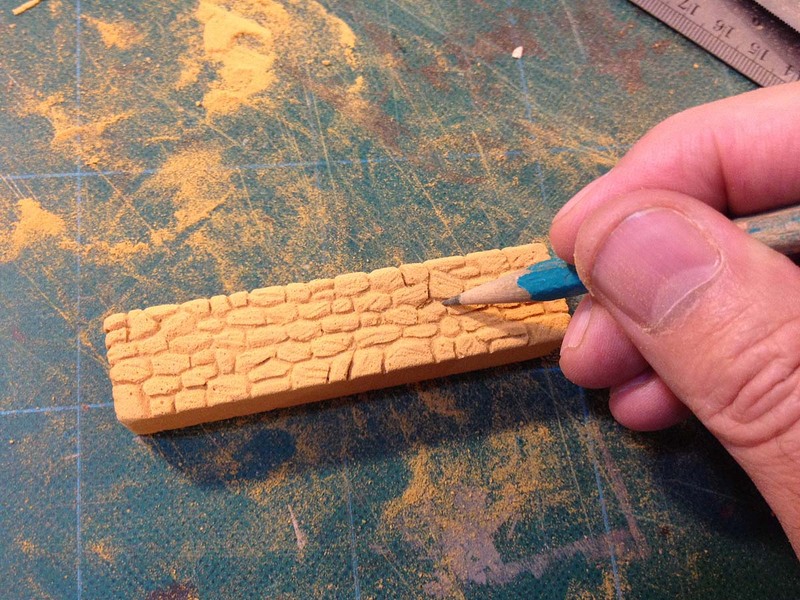 Here a hard 5H pencil is used to carve the mortar lines between stones. 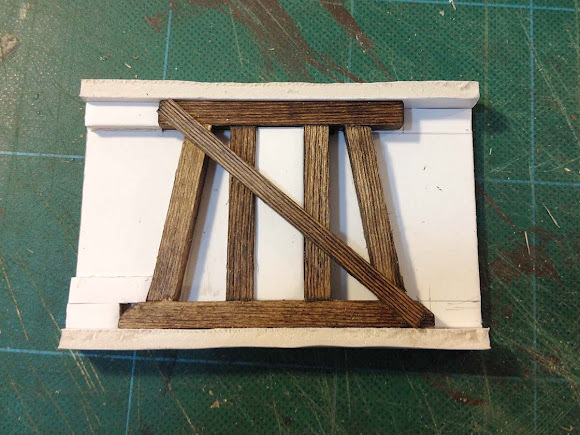 The carved Balsa Foam footings and abutments were first painted with a sealing coat of Buff Titanium acrylic paint. Here a stone retaining wall is also being painted. Once the base coat was dry, Raw Sienna was dry-brushed on to the faces of the stones. Individual stones were then picked out with earthy, contrasting colors like grey, Burnt Umber and Burnt Sienna. A completed trestle bent ready for installation. Each bent was detailed with 24 nut/but/washer castings and weathered with colored chalks. Oops! 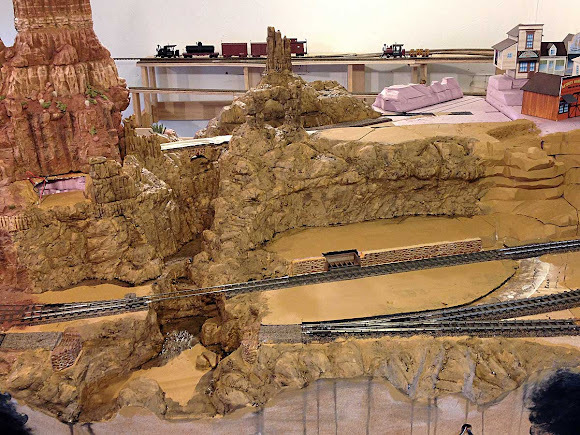 It turned out that one of the trestle bents would stand right on top of a large boulder already sculpted into the creek bed. 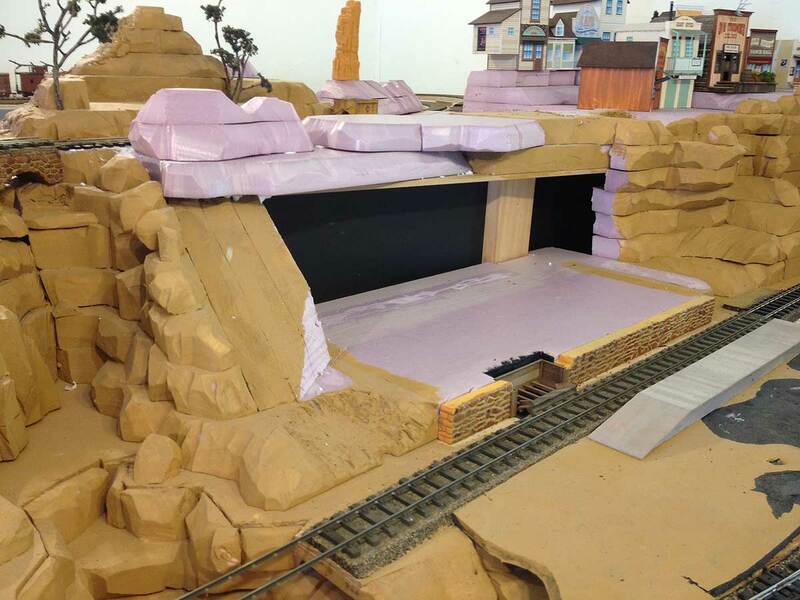 A portion of the scenery was cut away so that the bent's stone footing could be blended into the rock work. Here's a nifty trick I learned for mixing up small batches of plaster or, in this case, Sculptamold. Pour some into a ziplock bag, add a little water, seal, then squish vigorously until well mixed. When ready, snip off one small corner and squeeze out like a pastry tube. This works great for hard to reach spots where you don't want to mess up existing scenery or details. Here both bents have been installed and fresh Sculptamold worked in and blended around the left abutment. The deck is not attached at this point, just floating on the bents so that it can be removed for detailing of the creek bed. The big boulder has been repainted to match and blend with the existing scenery and real rocks and dirt added to the creek bed. 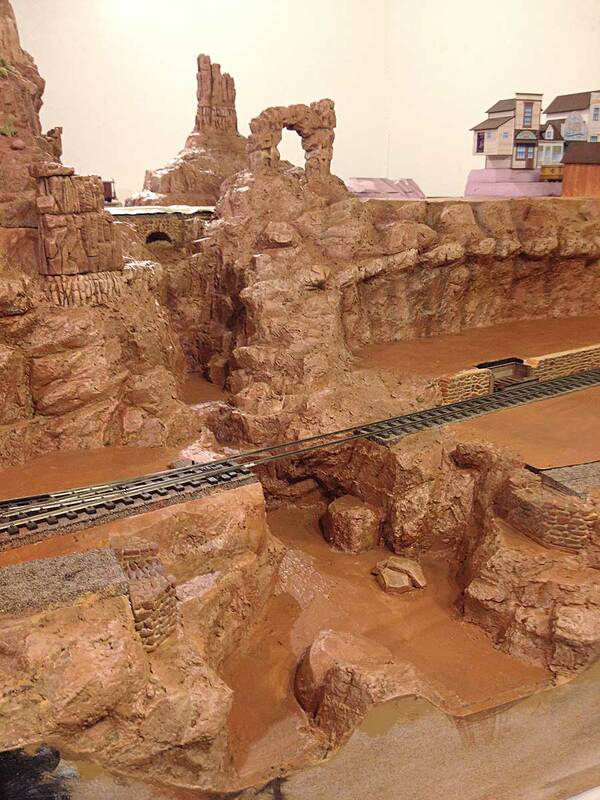 The creek bed stones were collected from real creek beds in Sedona, AZ and near Silverton, CO. 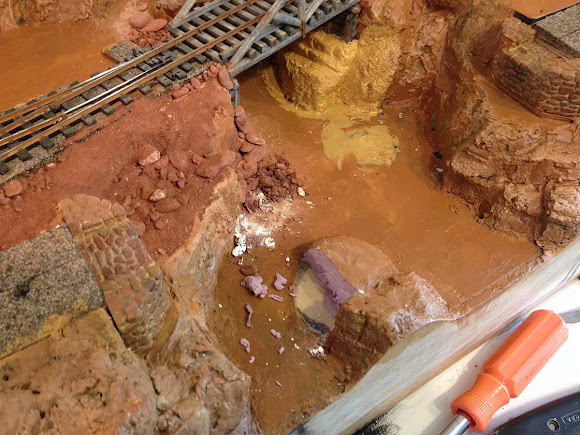 The rocks and dirt were cemented in place with matte medium and white glue diluted 1:1 with water. The fire barrels are painted castings from Rusty Rails. Here's a view from below Big Thunder trestle. From here I'll continue to detail the creek bed, adding more rocks, junk and some plants before pouring the Envirotex resin "water." Looking at our plan shows there's still much to be done before this area of the layout is finished. That should just about wrap it up for this week. I hope everyone is enjoying this build and that my explanations are clear. As always, any questions or comments are most welcome! If all goes according to plan, the next week or two should see the addition of cascading waterfalls and crystal clear pools to this scene. Thanks for coming along. Adios for now! 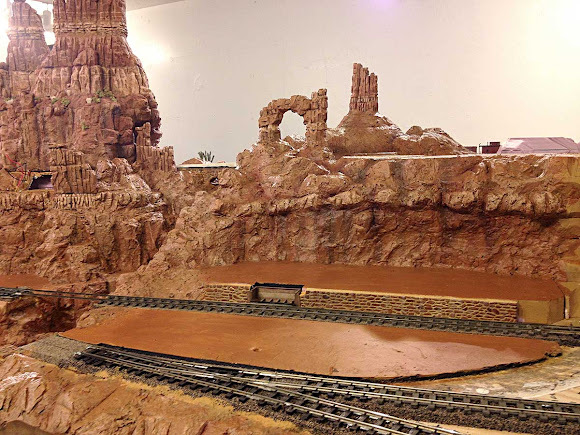 This fall I'll be finishing the scenery around Big Thunder Creek, a major scene on the Thunder Mesa section of the railroad. I've finally returned from my long summer break and I am having a great time getting back to work on the ol' railroad! 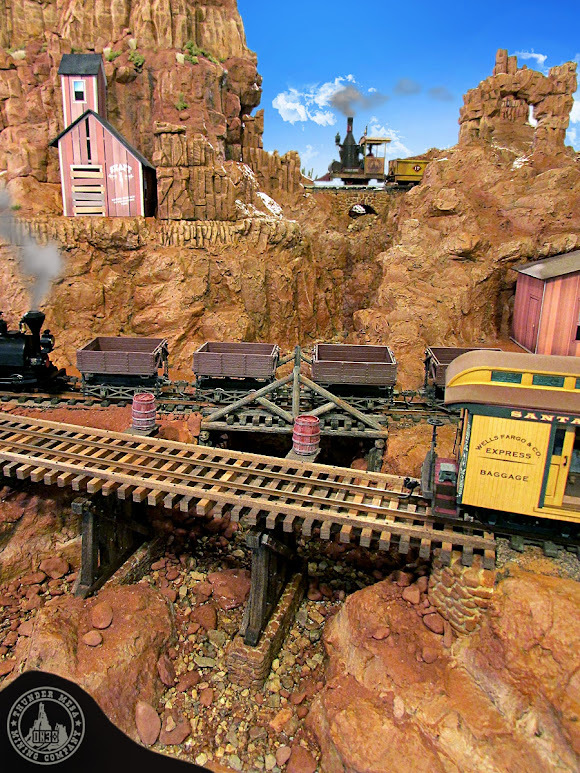 To start off this season's modeling efforts, I've decided to tackle some long delayed scenes around Big Thunder Creek. 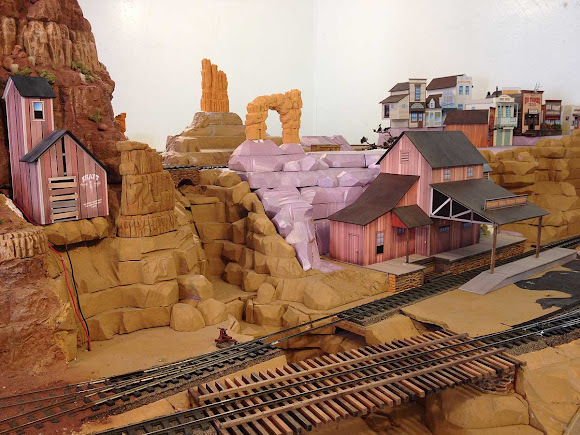 This includes the area around Thunder Mesa Mill, an old abandoned mine shaft, and part of the Calico High Line up on top of the mesa. 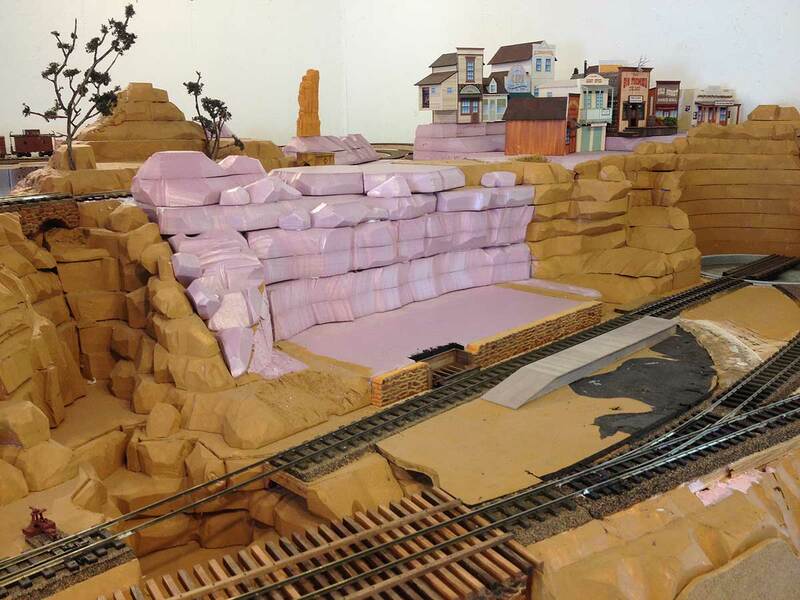 Once completed, These scenes will tie everything together from the Cactus Forest to the Depot area. Big Thunder Creek serves both to separate and transition between different scenes on the layout. There's tons of work to be done in this area and it should keep me busy through most of the fall. 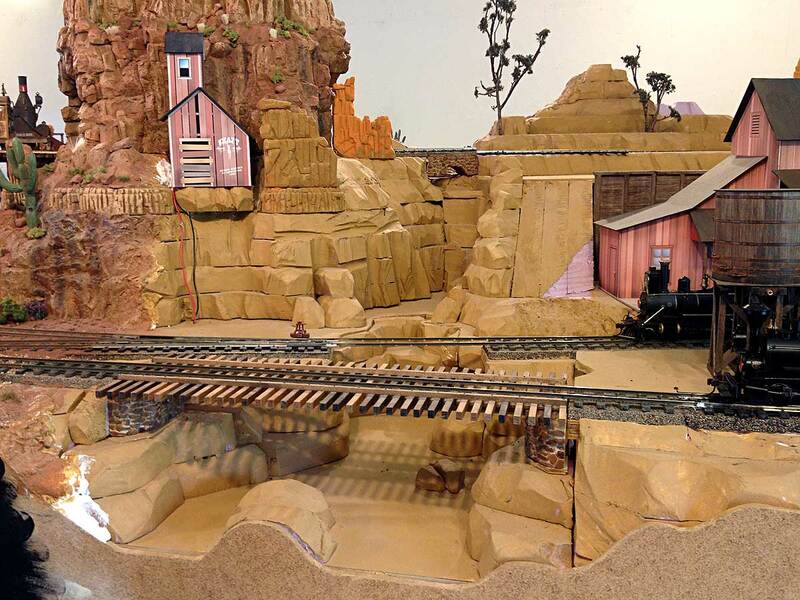 Aside from the creek itself, there are three bridges to build or complete, the track to paint, ballast and detail, various structures to build, and scenic elements like bushes, trees, cacti and ground cover to add. But first thing's first, and the entire area spotlighted above needs rock-work brought to completion from the bare polystyrene foam that has dominated for too long. Let's get started! This is how things looked at summer's end after cleaning off the dust and spiderwebs. The foreground bridge was originally planned as a pony truss and a kit from Black Bear Construction Co. was purchased to fill this spot. 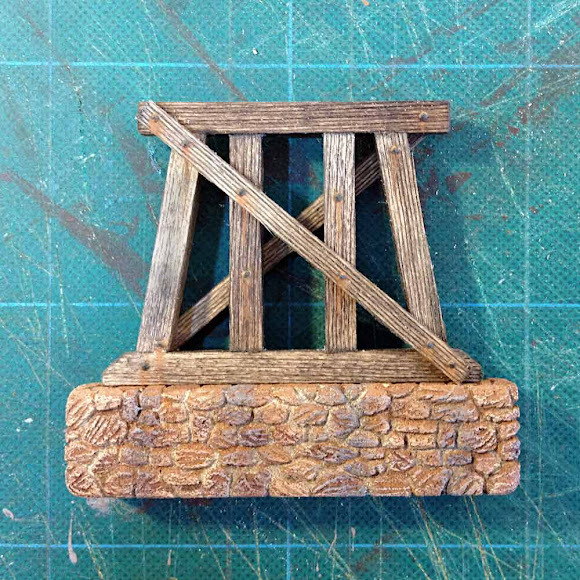 After getting the kit about halfway finished I decided that it blocked too much of the scene behind it so now the ties will be shortened and the bridge converted to a pile trestle. 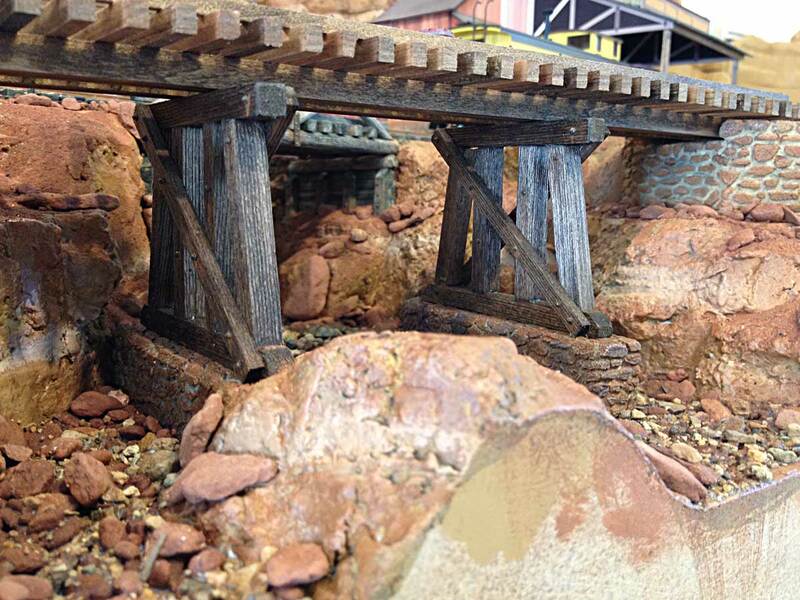 The shorter bridge behind it will be a scratch-built 20' king post truss. The uppermost bridge on the Calico High Line was craved from Balsa Foam and marks/hides the start of Big Thunder Creek. A paper-model mock-up of Thunder Mesa Mill has occupied this spot for more than two years, hiding the bare black fomacore behind it that marks the backside of Rainbow Caverns. This area will be addressed as well. The space was filled in and contoured with 1" pink polystyrene foam. That's an improvement but there's still a long way to go. Checking site lines, I decided to add a couple of Balsa Foam carved formations to the mesa top. "Window Rock" and "Little Thunder Butte" will add scenic interest and a bit of forced perspective depth to the scene when viewed from certain angles. The rocks were carved using my usual method. 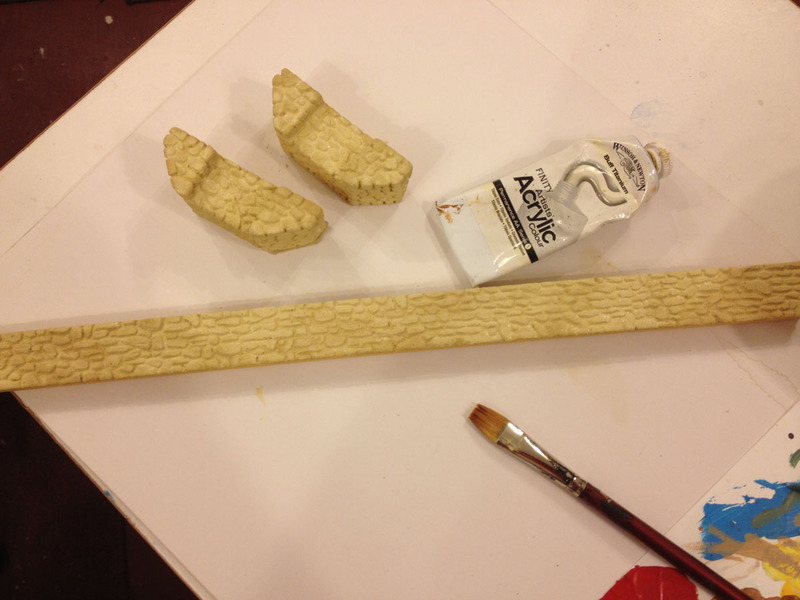 Here the scene is ready for the next step, adding a Sculptamold skin over the polystyrene foam and smoothing the transitions into the carved Balsa Foam. Sculptamold is a mixture of cellulose and plaster, available through many art and craft suppliers. I've never found anything that I like better for blending things together and sculpting rocky contours. 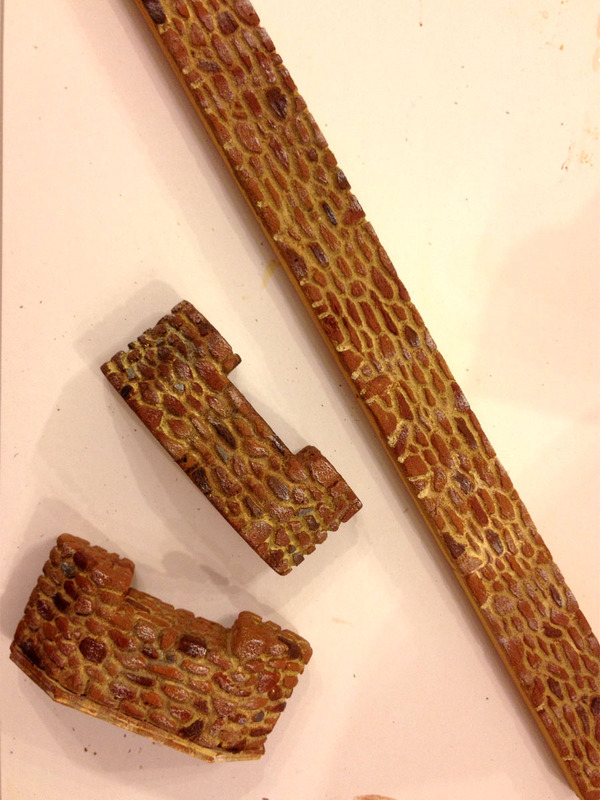 It' lighter than plaster, goes on like thick oatmeal and has a naturally rocky texture when dry. It's a messy process so I remove anything I don't want plastered before getting started. For more on how I contour Sculptamold, click here. One the Sculptamold was dry, everything was painted with a base coat of latex paint. The color is Glidden "French Mustard." After the base coat dries, all of the rock work is washed with a thin mixture of black to bring out the texture in the nooks and crannies. The mixture is just a few drops of Carbon Black with a lot of water. Other shades of black or India ink could also be used. The final painting goes fairly quickly. The rocks are all dry brushed with Raw Sienna acrylics right out of the tube, then Burnt Sienna, Burnt Umber and Unbleached Titanium are worked in sparingly to bring out details and contrast. If things get too dark, I go back and highlight by dry-brushing more Unbleached Titanium. For more details on my rock painting technique, click here. The cliff face and pad for Thunder Mesa Mill with Window Rock and Little Thunder Butte above. 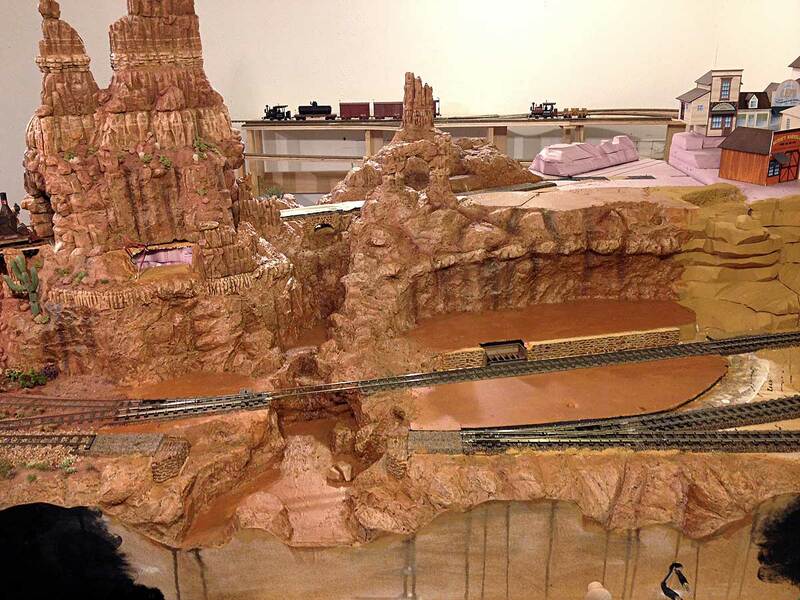 Soon this rocky chasm will be home to the churning whitewater of Big Thunder Creek. Okay! The hardest part is always just getting started and I'm happy to have this section of rock work finally complete on the TMMC. Right now I'm finalizing ideas for modeling the many waterfalls and drawing up plans for a rough-hewn king post truss. More to come soon! Adios for now.